A temporary statue head that raised eyebrows across the world is back in the hands of the artist who created it, according to the church's priest. A temporary baby Jesus statue head that raised eyebrows around the world is back in the hands of the artist who created it. "The artist asked to have it returned to her," said Gérald Lajeunesse, the priest of Ste. Anne Des Pins parish in Sudbury, Ont. "The reason she gave was, 'This is my most famous piece of art.'" The terracotta head grabbed global attention in October when it appeared on a pearly white statue of Mother Mary and her baby Jesus. The result was a bit startling due to the contrast in colours, as well as the fact that the clay began to erode from the rain about a week after it went up. 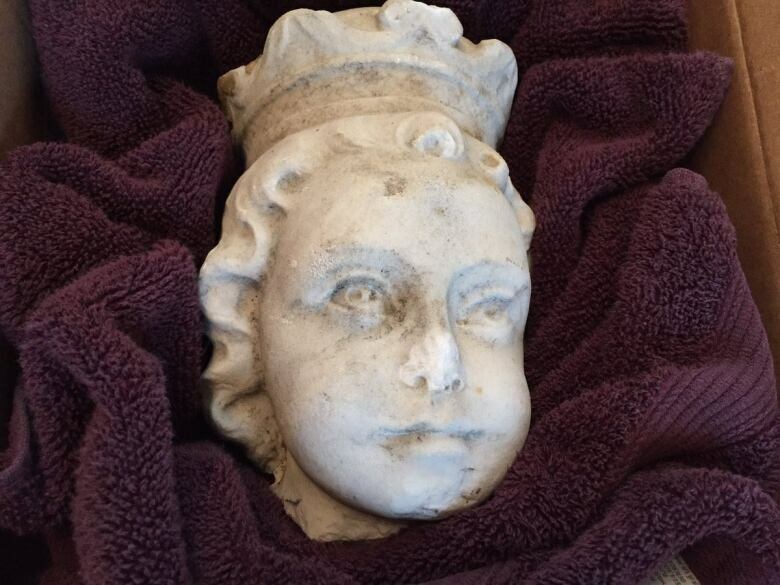 The original head was repeatedly stolen and had been missing for months when a local artist came forward, offering to construct a new head for the decapitated statue. The international attention around that temporary head led to the original missing head being returned to the church. The original head will be reattached to the statue in the spring — a process being paid for by a benefactor, according to Lajeunesse. Lajeunesse told CBC News that he promised himself the artist could have the unique creation back if she wanted it. "I was hoping to keep it myself. But the artist asked for it back. I had decided, by myself, since she had made it, if ever she wanted it back, she could have it," he said. "I have told her if she ever wants to sell it, I would like to be the first to be told about it." Lajeunesse said he and the artist have talked about her potentially creating a new piece of artwork for the church's yard.